For every single country, the bed rack of future is paved in the campuses of school, college and universities. As the future defenders of our countries from every walks of life evolves from the campuses. If these future brigades are neglected, country’s fate really renders in plight. For such majestic significance, student community are accredited with the vehement importance by the revolutionaries across the globe. On the other hand, conservationists or centrists always tend to restrict the emergence of student community. Naturally, they are the scathing critics of student movement. Our dear organisation SFI always encourages to build political environment amidst the campuses and prompts the student community to scrap the bondages of repression and exploitations. Consequently, the brave-hearts like Com Rohith, Sajin Sahul and K. R. Thomas become the martyr of Hindu fundamentalist atrocities. On the other hand Muslim fundamentalist forces snatched the life our comrade Abhimanyu. Secessionists butchered Niranjan Talukdar and Surya Debbarma. 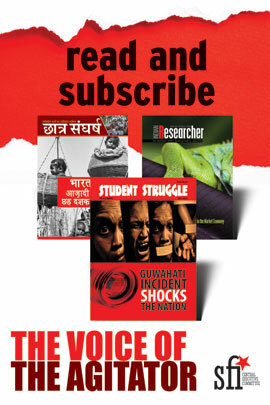 The autocratic rulers stifled the voice of Sudipta Gupta and Saifuddin Mollah. Actually these firebrands dreamed of a new India with a radiant provision of education and employment for all. 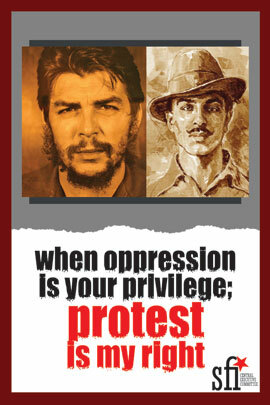 Unfortunately in contemporary India, reality marks the opposite picture! In a country like ours, 73% of the total resources are accumulated into the fold of 1% people. At the same the gross resource increment of the 67 crore people of India figures to only 1%. In fact on the last year, 17 new billionaires took entry into the club of billionaires of the country whose properties got increased from 15774 crore to 20678 crore in Indian rupees which is worth to 85% of total state budgets in the sector of public health and education. The tenure of “Acche Din” has gifted the 50% growth in the deposits of Swiss Bank on behalf of India. But while in his election campaign, our PM Narendra Modi committed to salvage the black money deposited in the Swiss Bank and also declared to distribute that restored money through crediting Rs 15 lakhs to the banks accounts of each of the citizens. When it is just few months left to complete his tenure as a PM, those commitments are simply sounding like fake promises. Day after day, discontents are arising out of the student community regarding the issues of scholarships. Youths have dumped by the void promises of creating 2 crore employment per annum. Central Government is suggesting to the youths fry pakodas instead of creating scopes for their employment. A lion share of the Indian demography is currently belonging to the age group of under-forty. Unfortunate the scopes of employment are gradually getting reduced. Foreign Financial Corporations have already withdrawn an amount equals to 70 crore from the Indian market. Last year 4.4% of production has been reduced at the manufacturing sector. The prices of basic equipments and ingredients essential for the agrarian sectors like seeds or fertilizer has been hiked vehemently in the recent times. Even for the first time in the history after the independence, this year India witnessed the lowest production of kharif crops. The poor and middle class are currently under the severe plight. Naturally, it has become a notion of luxury before them to afford their wards’ education to be pursued from the private institutions. In this circumstance while student movements are seeking questioning the government addressing their plights and Government is trying to destroy democratic space of the campuses. 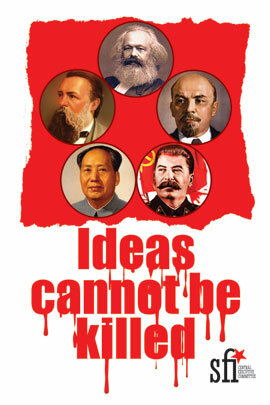 They are keen to put down the battle of ideas amidst the campuses. We observed that the Governments of all colours since 1991 have been arguing that at least 20% of the total expenditure on higher education should be recovered from students through higher fees which would tremendously increase the hardships on the students. The real motive behind the withdrawal of state from education sector is to give free hand to private corporate houses to use education as a profit making venture. As we know that India has now one of the signatory to the GATS and has provided special provisions in the education sector in the negotiations through the commerce ministry. 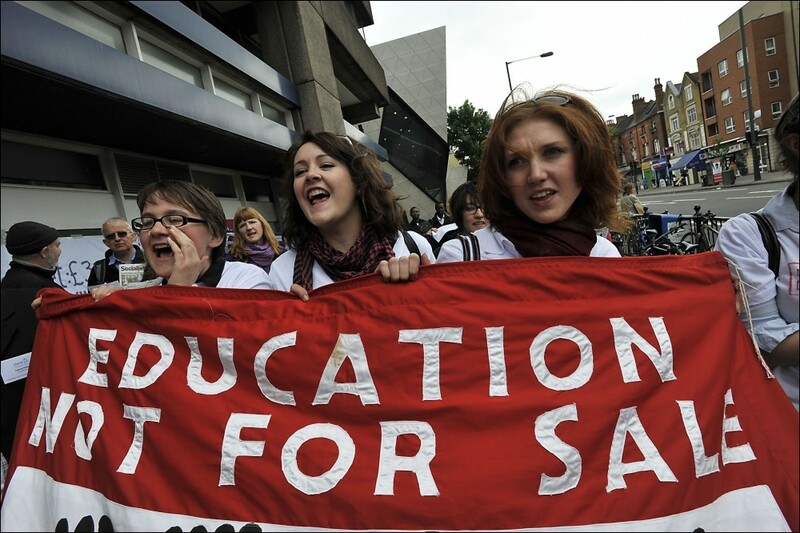 The private corporate houses target higher education mostly. But the interference of these private players would alienate a large section of students who would not be able afford the high fees in such institutions and would rob the higher education off its social values. The festival of loots in education sector is now reaching at the utmost point in this era of Modi raj. Recently Modi raj is eager to introduce New Education Policy which is one of such tools to eradicate the constitutional rights guaranteed earlier under the aegis of education system. Modi government declared to enact the new Education Policy within the next 100 days of just after coming into the power. Their draft education policy tends to communalise, privatise and centralise the entire education system of the country. They draft policy revealed their meticulous blue-print of educational plunder in the name of privatisation and simultaneously their forceful introduction of the manuwadi in the courtyard of the Indian education system. They are consciously letting the lanes of education to be shrunk before the students coming from the lower income groups. Consequently, budget allocation in the educational sector is gradually brought down by the government. The budget allotted for the purpose of education has been reduced to 0.45% of GDP in the academic year 2018-2019 as compared to that of figuring to 0.71% in the academic year of 2014-2015 denigrating the recommendation of Daulat Singh Kothari commission to spend the 6% of GDP for the purpose of education. Likewise, Modi government has reduced their budget allotment for education to 3.7% of the National Budget in the financial year 2017-2018 while they had allocated an amount of 6.15% for that purpose in their very first National Budget. Even in the academic year 2017-2018, 29% of budget allotment has been reduced in the schemes like ‘Sarva Siksha Avijan’. These directly affect the classrooms across the country. Scenario of school education has been rendered under threat. In many places, provisions of mid-day meals are getting closed. Troubles are also arising out of the issue of digital ration card. In such a perilous predicament schools are offered to the hands of private ownership by the government through the scheme of PPP (Public Private Partnership) Model. In Rajasthan BJP government has put 225 government schools into the private hands following such model. 15000 government schools in Madhya Pradesh and 13905 government schools in Maharashtra has been occluded by the BJP led state governments in those states. The state governments of Himachal and Haryana are the sincere followers of them. Although there necessitates at least a separate school for each of the separate villages, government majestically declaring of ‘Ekalabya Schools’ out of each blocks. As per considering the current socio-economic scenario and the state of security of the students in the rural India, it is of next to impossible before the parents to send their child to a school located far from their place. It has brought the school education in remote parts of the country before an uncertain question. Teacher crisis is perpetually getting acute as both the state and the central government are displaying serious indifference. It is near about 105000 schools across the country where there is no single other teacher. In the state like West Bengal has set a record before rest of the country through completely collapsing the process of appointing new teachers from the primary to the higher education. Few appointments which had been conducted under her tenure also resulted in wide corruption. At the same time,text-books provided by the state government are found with seriously mistaken information where saffronisation is given highest priority. Manuwadi outlook of BJP government is aimng to scrap the numbers of hostels and schools at the Adivasi-dominant areas. In the remote areas of country, the picture is much more pathetic. In accordance with the NCDHR report, since the last three years provision of various scholarships for the tribal students has been largely decreased. There is lack of permanent teachers in the colleges as the process of appointment has been stayed off since the last few years. Contemporarily, many colleges are in front of the crisis of expertise teachers for diverse subjects offered to be taught. A large number of seat-cuts have been taken place in the field of research in the universities including JNU as per the UGC gazette notification 2015. Under the tenure of this government, budget allocations have been ruthlessly cut for purpose of higher education and research. This government is deliberately enabling to ease the advent of privatization and centralization of education through dismissing other various autonomous institutions which decides the policies of education. As a consequence, MHRD is eager to collapse UGC through replacing it by Higher Education Empowerment Regulation Agency (HEERA). ‘Choice Base Credit System’ (CBCS) and ‘Rashtriya Ucchatar Siksha Avijan’ have been introduced also. These are gradually becoming the regulating authority on the issue of monetary sanctions. It is solely depending upon them whether they will grant monetary support to any state or academic institution. The condition is that corresponding institution must have to be run in accordance with the conditions applied by these authorities. Naturally, that in turns curbs the autonomy of those aided institutions. So far, central government has granted autonomy in favour of 60 academic institutions including 5 central universities, 21 state and 24 deemed universities and let them to introduce and run new courses and to set up new centre or campuses without any support from the government. Instead the government is clearly mandating them to manage the financial resources by their own. They are widening the avenues for privatization of education before all and sundry thus easing the inevitable introduction of tuition fee hikes through the mode of self-financing. Central Finance Ministry on their 2018-2019 budget, has declared that the government will sanction credits not aid to the educational institutions. Terms have been imposed in such a manner that the corresponding institutions are responsible to pay off those through fee hiking or selling research-patents. Thus the government institutions will also eventually be commercialised and that in turns will pursue the commoditisation of education. Meanwhile, government has sanctioned a grant of rupees 1000 crore to the proposed ‘Jio University’ of Ambani Groups before the foundation from the tax payers’ money. Government has taken the strategic stance of ‘divide and rule’ in order to suppress the rage of discontent into the classrooms. Modi government tends to play communal cards among the campuses and classrooms. In cases of most of the Central Educational Institutions, government is appointing RSS members or sympathisers. Intentionally they are highlighting the ‘Puranas’ through deforming the history of our country. RSS-led schools and ashramas have been largely expanded all over the country since last few years. Mainly in adivasi belts, students from the lower economic groups are invited through the allurement of money. RSS organs have been followed a massive growth in Bengal at this TMC regime. Even armed rallies have been conducted by the children for observing the religious occasions on the soil of Bengal. Across the country, girl students and the students belonging to dalit and minority groups are paying the price of their manuwadi communal violence in the campuses. 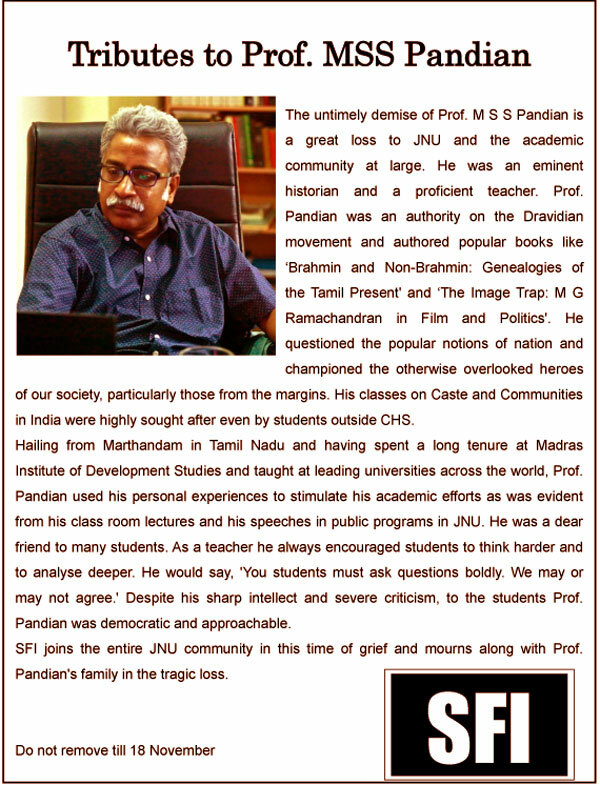 Few years back, in Hyderabad Central University, dalit scholar Rohith Vemula had been compelled to commit suicide. Caste and communal violence are rapidly rising among the campuses. While the government is keen to popularize the slogan of “Beti Padhao, Beti Bachao” at the same time Yogi Adityanath government in UP had backed the predators of sexual harassment on the girl students of BHU. Blue print was prepared to shut off the only university for women in Assam. Finally they discarded their decision before the movement of SFI. Also, in Bihar, UP, Haryana and Bengal the consistency of sexual violence is accelerating gradually. Wrath of privatization in the education sector of Andhra Pradesh- Telengana took several lives of the students. In West Bengal, Mamata regime added an additional peril of donation in the ruling party fund while taking admission into the colleges and universities. In accordance with the hikes of petro-goods, downfall of currency and introduction GST, donation rates for honours courses are gradually increased following a consistent growth! At the same time we observed the attack from the ‘Gestapos’ of this Modi government. The ABVP goons attacked our comrades from Kanshmir to Kanyakumari as the SFI comrades has always been taking the front role to resist fundamentalist forces in all battlegrounds. Such circumstances have given birth of densely organised student movement through-out the country demanding for educational rights under the banner of SFI. Locally, struggles are carried on a large of local issues. 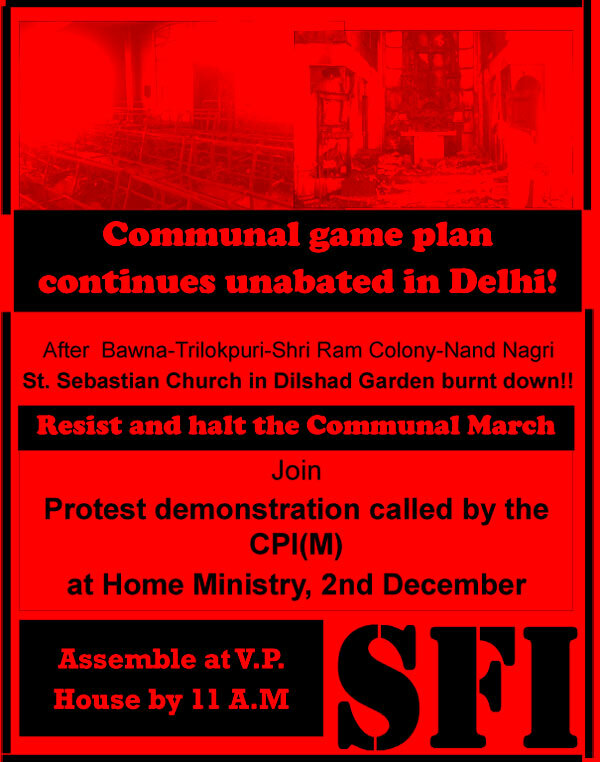 Our comrades are marching on the streets against the bus fare hikes in Tamil Nadu or tuition fee hikes in Himachal and struggling for the demands of students’ hostel in Maharashtra and Andhra Pradesh or raising voice for the security of girl students in Assam. In Kerala, SFI comrades have raised their hands beside the flood affected people. Naturally, the student communities from JNU, Maharashtra, Kerala, Rajasthan has casted their verdict in favour of SFI and organised student movements during the union elections. Although, being attacked every time by the tyrant state government, the students of Bengal leading this battle of ideas following the legacy of indomitable spirit of organised student movement. Since the last few months, students from the Jadavpur University, Presidency University and Medical College have snatched their attainable demands from the despotic government. 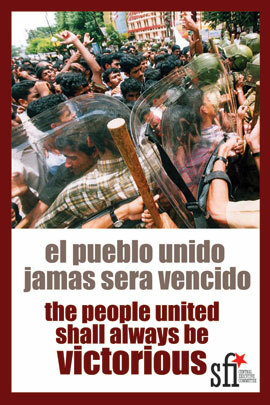 United student movement has won in such battles. 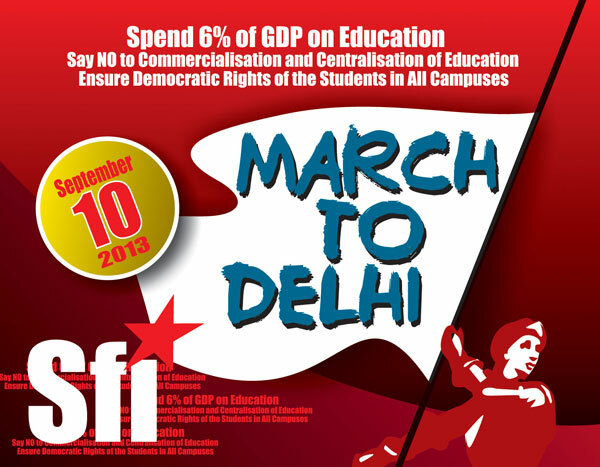 SFI is raising the day to day demands of the students in districts to metropolitan centres. Recently SFI completed its jatha which was started from the four corners of India,demanding ‘quality and scientific education without discrimination’. The growing consciousness of the students are being now seen as a threat to the government, while the PM blabbers about making India the best in the world, his followers are on a run to challenge the spirit of the students. From the City of Joy to the Pink City, from the Paradise on earth, to God's own country, the attack on the minds continues to uphold a gimmick of superiority without free thinking. SFI has been meticulously and tirelessly fighting for the students and building a scientific temperament across the country. 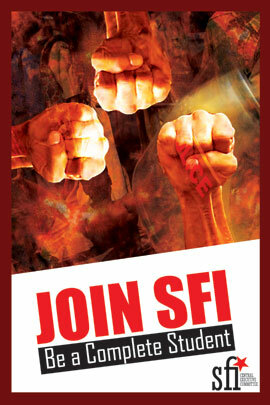 In times, when the shadows of the Rightist minds tend to overtake our thoughts, SFI stands out with a beacon of hope. 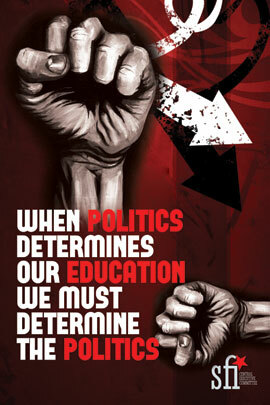 Time has come to fight the battle on the demands of education and employment. Vehement unity of students-teachers-researchers-non-teaching-staffs and guardians is the need of hour. Our patience, humanity, creativity, courage and most importantly our ideology will guide to fulfil our goals. The ideals of ‘study, struggle and sacrifice’ will defeat the money muscle power, and will bring back a brighter dawn. Heralding the message of resistance, SFI 16th All India Conference will start from October 30th to November 2nd has added an additional strength to the voice of resistance and alternative ideas across the country. We have pledged to save the education, the country and defeat communalism. So, we have promises to keep. We have miles to go otherwise history will not pardon us. Finance Minister Arun Jaitley just gave away his fifth and final Budget speech at the parliament this Thursday. This budget, for the country and the BJP, led NDA government, has remained to act a crucial one. A couple of factors determines this - Firstly, its the first budget that the country is witnessing after having one of its major economic move getting rolled out - the change of taxation to the Goods and Service Tax(GST) system. Even though the change to GST, albeit the need to wait for further improvements and clarifications, has given an uncertainty on tax mobilizations, providing it with that of the practice of a year of demonetization had made the FY17-18 become a complete economic disaster. We have already witnessed a steep decline in the GDP count after the third quarter of last financial year to a nearly 2%. Thus, the two policy moves have its own stake in forming the budget policy whether it be on the allocation side or on the understanding of the revenues to be generated. So it becomes an important factor in the planning of the fiscal policy as well as the fiscal deficit expectations accordingly for the upcoming financial year. Secondly, due to the harsh repercussion that the government had to face on grounds of the aforesaid reasons and the elections to the lower house is getting geared, the BJP government had to wrap the scene up and come up with an election-friendly budget that is ‘seemingly’ more to the welfare side. As for a simple read, one might find, provided with the eloquent rhetoric skills of the finance minister, the budget presentation a better one that has gone through and addressed all the sectors, but it is the nuances that give you the facts and whereabouts of how much it is and will have effect on our daily lives. 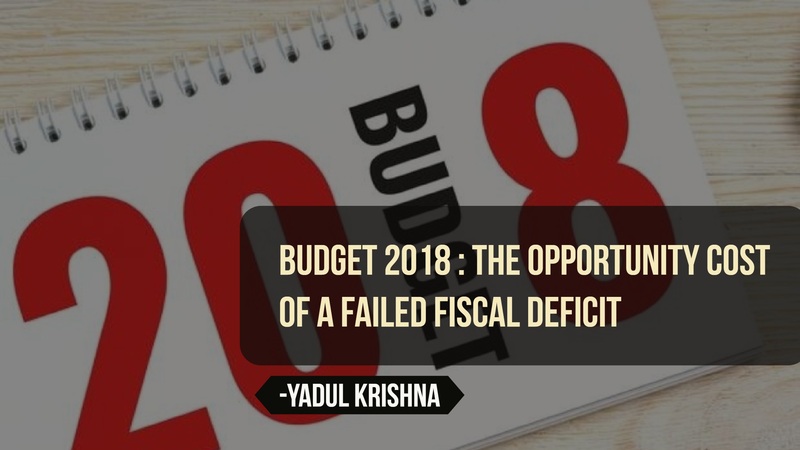 The government has started presenting the budget with programs that are not just impossible to get implement with the available resources, but also will have an adverse effect on the budget deficit targets even if it gets implemented in one go. It is very much visible in this budget that, by hurting the funding for the common people’s welfare, the government hasn’t forgotten to discharge its duties on fulfilling the needs of the rich and corporates through formulating the budget accordingly. But, this assault has, however, came up taking the form of a populist budget, giving them an inclusive face, whereas there is nothing much to ponder about in actual terms of effect, other than it being negative.Despite the fact that the total expenditure has come down to a 13.04% share of the GDP compared to the former year, the term contractionary budget has itself become a cliche in analyzing the budgets of India in the recent years. This year, the government has come up with a desolating budget that doesn’t take care of certain sectors of the economy. The government further boasts of making the rural sectors and farmers well off with the budget. But the actual facts just tells you the contrary. For the rural sector, the budget states that more efforts will be given in building infrastructure rather than addressing their critical concerns. This need not be what the people are wishing for, given their present condition of socio-economic disparity. As for the farmers, only minimal efforts have been taken to address their issues. Till the past years, as all the past economic surveys have always warned, the condition of the farmers has always kept on deteriorating and has seen no increase in their development, except the development of the numbers in farmer suicides. However, suddenly, as the last year of the ruling term, the budget is trying to project the proposals for the upliftment of the farmers and the aged. For that, the budget put forward the idea of Minimum Support Price(MSP) in terms of cost of production. In this light, it is also to be noted that the government has not yet made any clarifications as to which cost they are going to take in account, provided that the term cost in economics is very broad, which again puts a concern as to if the farmers are actually entitled to any benefits. The same case goes with the youth population and in the education sector. There is nothing in the budget on how new jobs are to be created except stating that it will. The funding for education has also been reduced from the percentage share of the GDP with respect to school as well as higher education, not to mention the drop in UGC funding. It is also depressing to see the government initiating the move to replace blackboard to digital board across schools in the name of digital technology while there are thousands of children in the country who are still failing to get access to schools, of which even the schools doesn’t have the basic facilities to occupy them. The budget is also trying to portray with statistics of having certain fundings kept stagnantly or increased with that of the former budget, whereas they haven't exhibited that it's not in real terms. It is practically impossible to have all these goals in the budget achieved with the fiscal deficit target, which even now is itself higher than the expected target, making the policy announcements a mere promise to be faked. ie, the schemes proposed in the annual budget will only make the GDP look more unfeasible with the 3.3% projected fiscal deficit. Also, as asserted by the finance minister in his speech, the target to attain a hike in economic growth of 7.5% in GDP by the next fiscal also becomes impossible to achieve. Since the economy is yet to recover from the disastrous effects of demonetisation, the budget should have had proposals about investing in the needed sectors, thus creating demand in the economy and to solve those issues that came as a byproduct of demonetisation like revival of those in the informal sector and providing people with more employment opportunities. But none of this has happened except that they have come up with proposals for drastic cuts in the payments that were to be spent on education, social welfare and development of youth, women, and children. So, as aforesaid, if the government fails to create demand for goods and services in the economy, like what has always happened in the past, the move can even drive the Reserve Bank of India in cutting down the interest rates which will become difficult to catch up. This budget has high complications with respect to fiscal consolidation. The government has allowed for fiscal slippage and this failure will have huge effects on the economy. The deficit for FY17-18 was kept higher to 3.5% than the target of 3.2% and this year also it fails in keeping it to the target of 3%, raising it to 3.3%. Also, the move of the government to increase Rs 50,000 crore worth further market borrowings of dated government securities will also lead to elevated fiscal slippage which will hinder economic growth recovery by conserving higher yields and getting the lending of rate cuts delayed. There are several consequences if the targeted fiscal deficit gets failed. For instance, the investors who buy bonds will yield higher rates if there is an increased amount of borrowing.This in turn, in all respects, will affect the interest rates. Another such problem relating to this is the emergence of credibility risk. As of raising capital receipts in the present form is concerned, the government’s assurance need not be taken seriously by the investors, which for them can be costly, and in turn, effects planned investments. Having a high fiscal deficit also means that the government is not able to generate more than that of what it is spending. Therefore, this propels the government to increase the taxes in many ways that best suits them, so its debts can be payed-off in the future. This process can, however, not just be concerned with higher taxes, but can also be with higher inflation. And if the expenditure increases up from the present target, as in cases of the rise in international oil prices, it again will lead to further widening of the fiscal deficit. Perhaps, there is even a bigger issue with having a high deficit. It minimizes the possibilities of retrieval of the economy if we are to face any kind of unanticipated economic changes in the future that can happen rapidly, even if such event occurs in the global economic scenario. Anyways, whatever it be, those who always get affected are the common working people of the country. This budget is a clear gesture of reconciliation shown by the ruling class towards the rich neglecting the actual problems of the commons and the working class. The retortion made by the worker's wing of the ruling BJP, the Bharatiya Mazdoor Sangh, stating that the budget is disappointing and has totally neglected the workers, speaks volumes on how anti-people the present budget is. Keeping in mind the factors stated above, yet again, the government, through its regressive budget, has shown its apathy towards the people of the country. SFI is to organise a one-day national convention of students studying in the universities which has been listed for grating autonomy by the UGC. This is a stingent attack on the public funded higher education. The convention will take place in Delhi on April 7th. Modi government whose track record is filled with uninterrupted attacks on higher education , has unleashed another brutal attack by their latest decision to provide autonomy for 62 higher education institutes. It is alarming that instead of democratically discussing this decision in Parliament and addressing various concerns of other stake holders, they have unilaterally decided to impose this on us through UGC. The UGC Notification which deals with autonomy is unambiguous on the meaning of autonomy. The University will have autonomy to start new courses, new centres, off campus centres, incentivize talented faulty by additional pay etc. But they categorically state that no funding will be provided by the government for this purpose. A cursory look on the clauses make this evident. Mobilsing funds for these purposes can be possible only through Self-Financing. From examples of universities in the West, it is clear that Self– Financing would invariably result in changes in fee structure and increased role of private players. This would mean that only a privileged few can access higher education in India. Doors of Universities like JNU which is already closed to marginalized sections due to the draconian 2016 UGC Notification will remain forever closed. Increased Role of Private Players-The UGC notification also states that Universities can have increased collaborations with private players. But private players are not innocuous entities. They have their own market centric agenda rooted in profit. They would have no incentive in supporting critical studies, which Universities like JNU are known for, resulting in reduced fund allocation for these departments. Saffronisation of curriculum– The timing of these notifications is perfect from the view-point of RSS. They have appointed their men in almost all the leading Universities of this country, giving them a free hand in deciding different courses. Although UGC states that statutory bodies should be consulted for these changes, from the experience of JNU, we know how these bodies are misused by the administration. Obsession with Foreign faculty and Students– The policy of this government to use autonomy of higher institutes to attract foreign students and faculty to India makes no sense. It is the same government which overlooked competent individuals and appointed Sanghi stooges in Universities like JNU. Appointment of foreign faculty members would require additional resources which would further bleed students. The notification also states that there can be 20% reservation for foreign students. This is a significant number. Ours in developing country, where the primary motive of the government should ensuring that maximum students from deprived background access quality higher education. We are in no position to turn our higher educational institutes into educational hubs catering international market. Incentives to talented faculty members? The Notification also states that the University can give incentives to talented faculty in the form of extra payment. But there is clarity on how this talent is measured. Ultimately, this would mean that Sanghi Chamchas of the government/Vice Chancellors, who are invariably incompetent, would be given incentives for their loyalty. Overall, the autonomy clause is a merciless and brutal attack on higher education. It should be noted that many of the clauses in this notification have been purposefully made ambiguous for ensuring maximum impact. For long, the WTO has recommended withdrawal of Indian government from institutes of higher education. Modi government has made this a reality. But they forget that it is unbridled privatization which has made students across the world hit the streets against their governments. The same will happen in India. Education is considered a tool to inculcate the independent thinking among students. The basis of the education is the conveying real facts and established principles to the students through their curriculum, equipping them to analyze these facts and evolve their independent thinking. This will lead to a rational society but education is used as a means for ideological indoctrination by the RSS and BJP, for communalizing the entire society to implement their strategy of establishing a Hindu Rashta. Present BJP Government is not only using education institutions to communalize education through the presentation of wrong facts, fabricated history, wrong interpretations but also using these institutions as a tool for opinion building and defending their economic policies. This is a very dangerous trend where the communal government is using educational institutions to justify their failed and anti-people policies and religion is used to justify government’s unjustified actions. One such case is an attempt of saffronization of higher education in Banaras Hindu University. It is a reflection of the agenda of the RSS and BJP when questions like “Manu is the first Indian thinker of Globalization; Discuss” appears in the examination of Masters of Arts in Political Science. In Banaras Hindu University which has recently witnessed determined struggle of girl students against University administration and the Chief Minister Yogi Aditynath on the question of their security, MA 1st semester students were shocked when they saw question paper for subject ‘Social and Political Thoughts of Ancient India’. They were asked to write an essay on nature of GST in Kautilya Arthshastra or Manu is the first Indian thinker of Globalization. Discuss’. This is not a simple case of questions from out of syllabus but reflects the kind of conspiracy working to ruin the Higher education of India. In the above example, students are forced to think and write in a certain way or they have to lose marks. This is the whole idea to compel students to think in a certain way. According to media reports (quoted anonymous student) says “These ridiculous and unpalatable questions in question paper are really disheartening. Students are being taught these fictitious concepts just to validate the policies of the present government. Even last year, students were taught the benefits of demonetization and that characters in Ramayana had used surgical strikes to defeat enemies. However, we were not tested on them after we objected,” complained a student.” (The Indian Express, 7 December, 2017). It is well-established fact that demonetization which was considered master stroke of Prime Minister Narender Modi has severely hit the economy and poor public has to bear the tragic pain by giving their lives standing in the long queues in front of ATM’s and banks. Millions of people lost their employment which affected their families. There are various assessment regarding individuals losing their jobs and lives but number of affected people increase many folds as demonetization ruined their families also. While people were coming out of this disaster of demonetization, then came GST hitting hard on the business. BJP and RSS have realized that history will not forgive them for these anti people policies so they are trying their old established theory. They don’t want people to assess these policies but are forcing people to think only benefits. They are discussing these policies in the class room to have their real analysis but trying to portray them as noble and useful policies by linking their false roots to our ancient fabricated history e.i. GST with Kautilya and demonitisation with Ramayana. 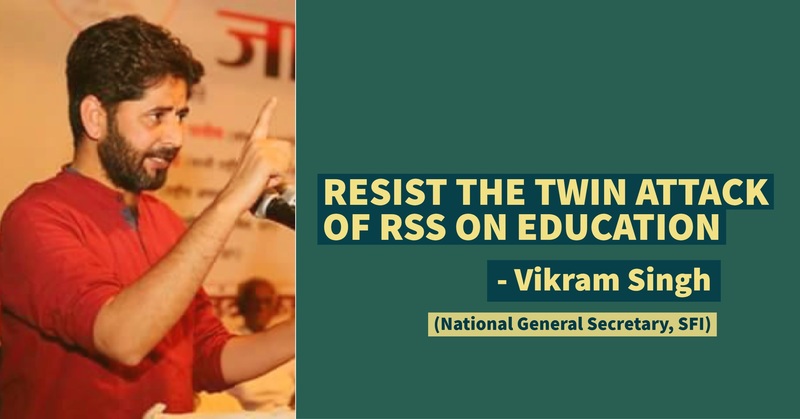 RSS is trying to control the whole structure of education institutions by deploying their persons or pracharaks who are justifying these attempts by their blatant lies. In this case also the person responsible for setting of question paper is Professor Kaushal Kishore Mishra, from BHU’s Faculty of Social Sciences who openly admits in media that he is a member of RSS. Professor Mishra gives a list of ridiculous justification for teaching these biased concepts in class room and in support of these questions which carries 15marks each. It is important to note that education is being targeted by central government and RSS right from the first day. In the name of Indianisation, they are trying to communalize it and trying to propagate their ideas. Pseudoscience and false history is being taught to students in various BJP ruling states which are polluting the young minds with venom of communalization. There were attacks on the institutions of Higher education. But now they are directly interfering with the content of Higher education also. Indian education system doesn’t stand for these values. Universities especially are known to promote rational and logical thinking. It is a clear indicator of RSS’s slow but deliberate attempt of “saffronising” the education system of the country and in the process, feeding large number of young brains with their core ideology of Hindutva.